Breaking our journey on the return to Nairobi, we will be stopping at the Lake Nakuru National Park. 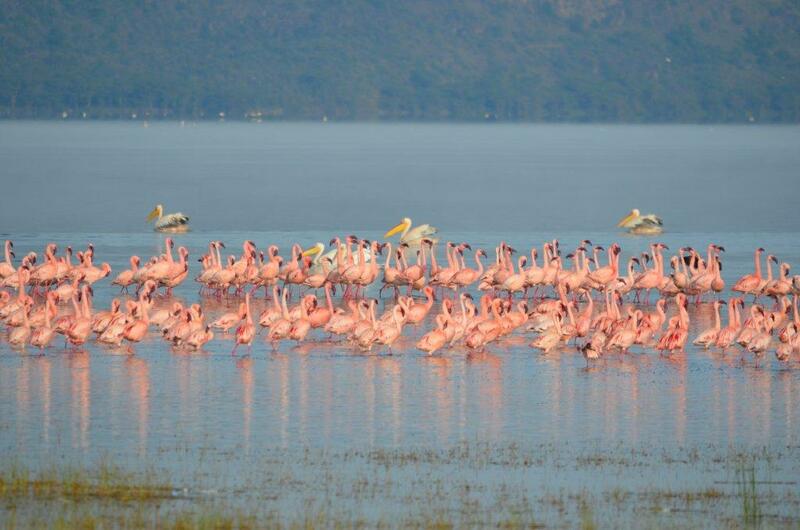 Nakuru is one of the alkaline Rift Valley lakes and a fantastic bird sanctuary. Its shores are populated, at times, by more than a million flamingos. The park was declared a rhino sanctuary in 1987. From then on, reintroduction of specimens of both black and white rhino has made Nakuru one of the main rhino refuges in Kenya. In addition to birds and rhinos, the park is home to a large number of mammals, including carnivores such as lions and leopards. Sarova Lion Hill Game Lodge is nestled along the Lion Hill overlooking the spectacular flamingo pink rimmed Lake Nakuru. The lodge is cleverly laid out, such that most rooms and sitting areas afford stunning views of the lake and the park. The lodge incorporates natural landscaping with tall acacia trees, winding walkways and greens dotted with bird feeders. The lodge is a natural haven for birdlife and attracts over 50 species of birds amongst the 400 species that inhabit the park.